To brown and gold broken up only by beets, Swiss chard, kale and lettuce. Not only is the growing season drawing to a close for many of us…but it’s time to clean up! I used to hate cleaning up my garden in the fall. When I looked out my kitchen window and saw more brown than green, I would grimace and think, “…next weekend.” Inevitably, clean up kept getting pushed back by other, more pleasing events like the Brewfest in Kennett Square or the Hagley Car Show . 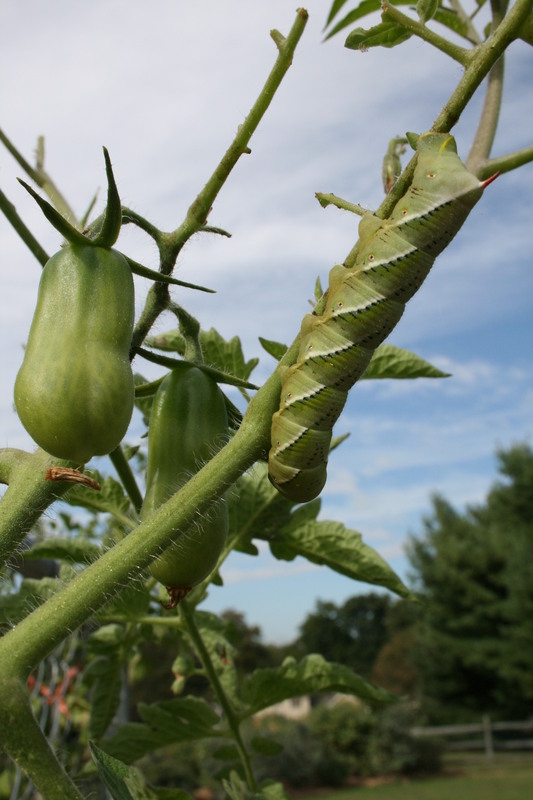 A tomato horn worm in my garden. I’ve discovered that cleaning up is the perfect time to find unwanted visitors like the varmint that was eating my tomatoes. 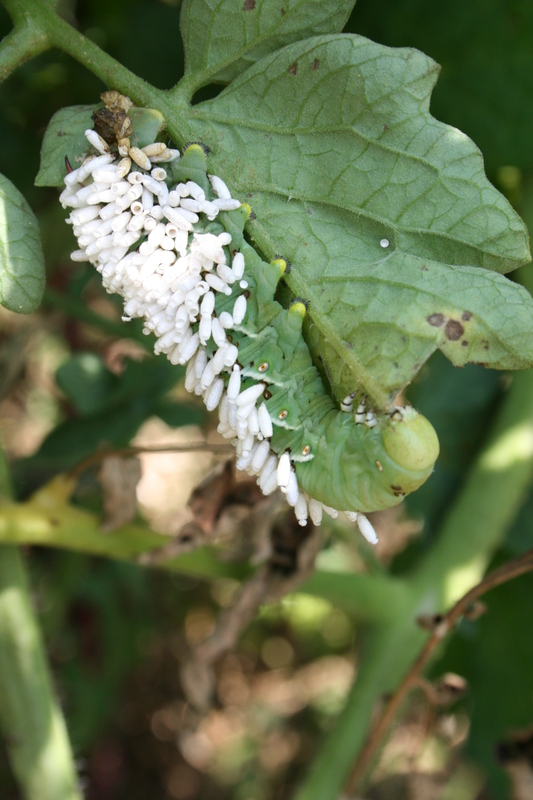 This fat and happy tomato horn worm is enjoying his last meal. While tearing down my tomato trellises, I found a dozen of these beautiful but sinister worms as I cleaned up the tomato bed. But I also learned that all but 2 were covered with trichogramma wasp eggs, like the little fellow below. 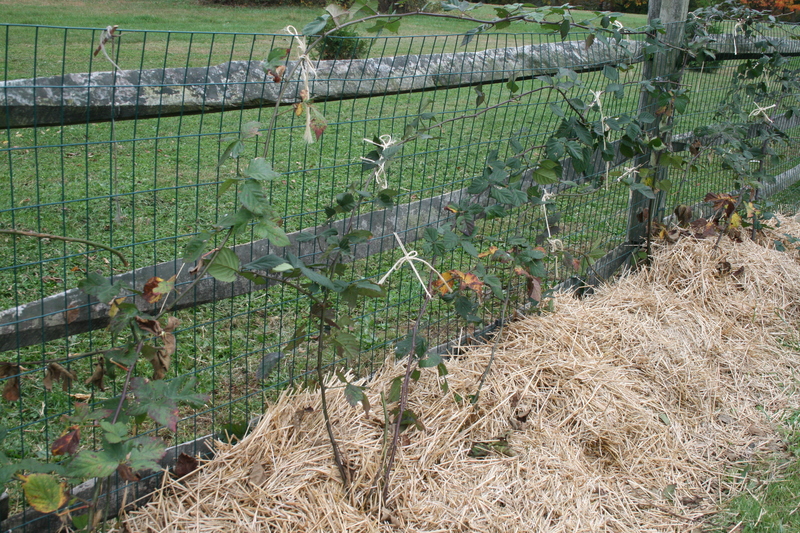 Fall cleaning, removing leaves, vines and stems, raking up fallen bits and pieces of this year’s green bean and tomato plants, all these activities help me get a jump-start on my garden next spring. A bucket – I use an empty kitty litter container and I use it to pick up all the green or rotten produce that hits the ground at the end of the season. 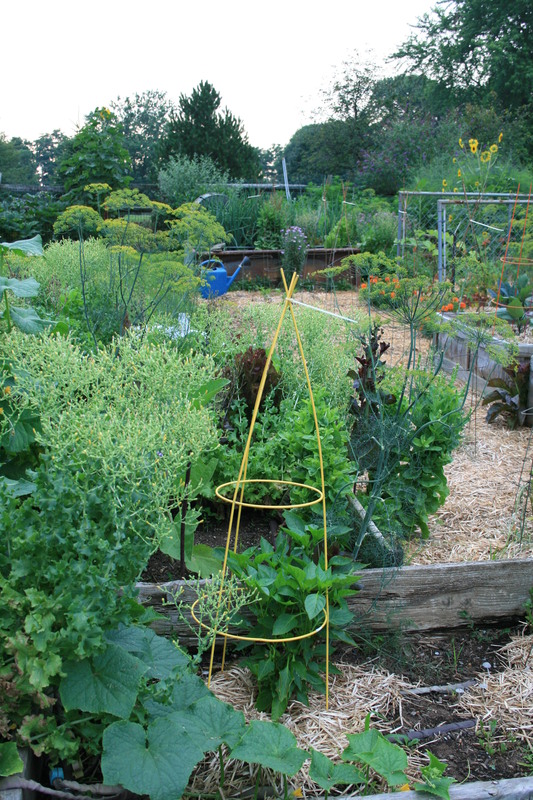 Large trash bags – I didn’t use to bag any of my garden waste but I learned that trying to compost vines from tomatoes, zukes, cukes and even green beans meant giving diseases like wilt a head start next spring. It also meant providing warm, cozy homes for Mexican Bean beetles and cucumber and squash beetles among others. My dogs helping me to bag . 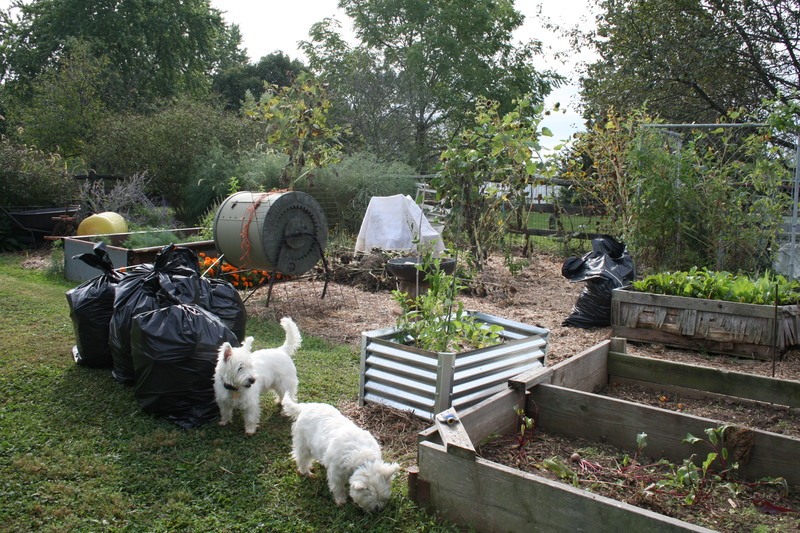 I pull all plants (except perennials), shove the waste into bags and stack them on the edge of the garden. I know some people put their plant bodies in the compost but I don’t. Why not? If you’re a slow composter like me, letting nature and God do the work for you, you probably shouldn’t put your garden detritus in the bins, either. Seeds will germinate. Diseases will survive. 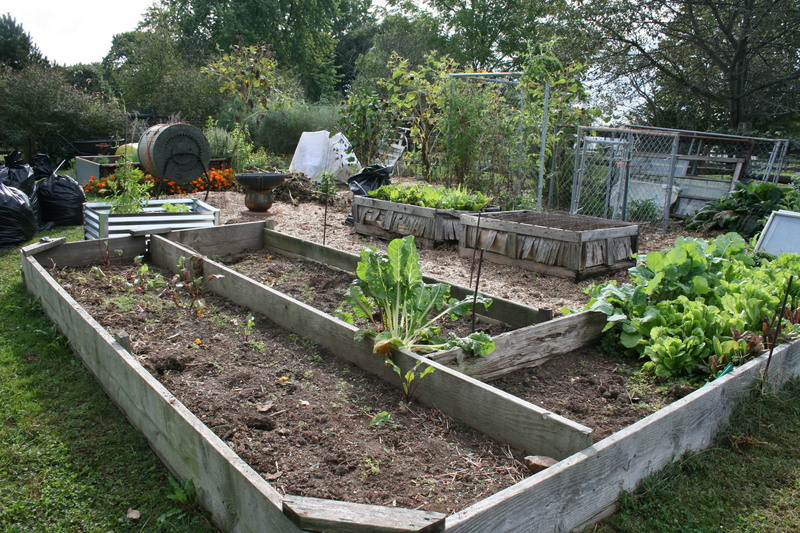 When you spread your compost next year to welcome your new seedlings, you may be welcoming some very unwanted visitors. Once the ground is cleared, it’s time to cover it. I use straw and a lot of it. It mulches the ground, protects perennials and annuals like garlic and beets and sets me up for weed free gardening in the spring. I offer one last bit of advice for wrapping up the growing season and getting ready for your garden next spring. NOTE: Pyrethrin is a contact poison which quickly penetrates the nervous system of the insect. It will affect bees and some beneficials so I wait until I have had two hard frosts to use it. I want to make sure there is no insect activity in the garden. Also, pyrethrin is harmful to fish so if you have a pond or your garden borders on a stream, don’t use it at all.